Here it is the location you have been searching for. 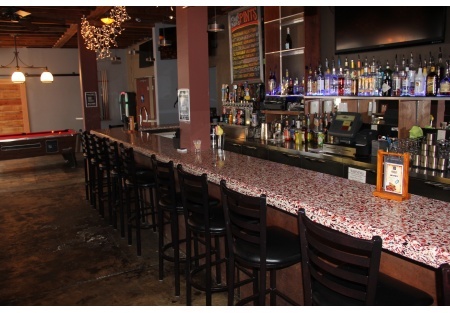 Outstanding Hillcrest restaurant and bar location with full liquor license. Huge patio area and a very nice long bar area. Sellers recently constructed the kitchen and it is ready for just about any concept. Is one of them yours? If you have been looking to get into a super busy area this is your chance. Step right in to a restaurant/bar where the sellers have done all the time consuming (nearly one year) and expensive (300K) part of building out a location. Reap the rewards of having had them do the work for you and get a huge discount on top of it all. The back patio area is the ideal outdoor space and perfect for this type of gathering space. Restaurants up and down the block are standing room only with huge wait times, bring your concept to this very popular and densely populated neighborhood and satisfy the demand for good food, drinks and a hip place to hang out. Demographics are ideal for mid-priced meals and drinks. The area is begging for more restaurants and bars do you have the next hot idea? Kitchen is well equipped with hood and new fire suppression system, grease trap, and all the equipment you will need to prepare for nearly any concept you can imagine. Video surveillance and a Micros POS system keep track of your investment and help keep your employees honest and costs down..
Current sales are averaging 35k per month, the location is right; just needs a push in the right direction from an experieced and dedicated operator. Revamp of current concept or a complete change out for something new and fresh, choice is yours. Total enclosed space for this restaurant and bar is 4500 square feet. You get 1500 of inside square feet and 3000 square feet of great outdoor patio area. Current lease term expires in December of 2016 with options available for additional term. With the right tenant the landlord may be willing to negotiate a brand new lease. If you are looking in the Hillcrest or adjoining areas this could be the place for you, saving you big $ and endless aggravation vs. building out a space on your own. Please visit our website at SellingRestaurants.com to get the name and location of this restaurant.